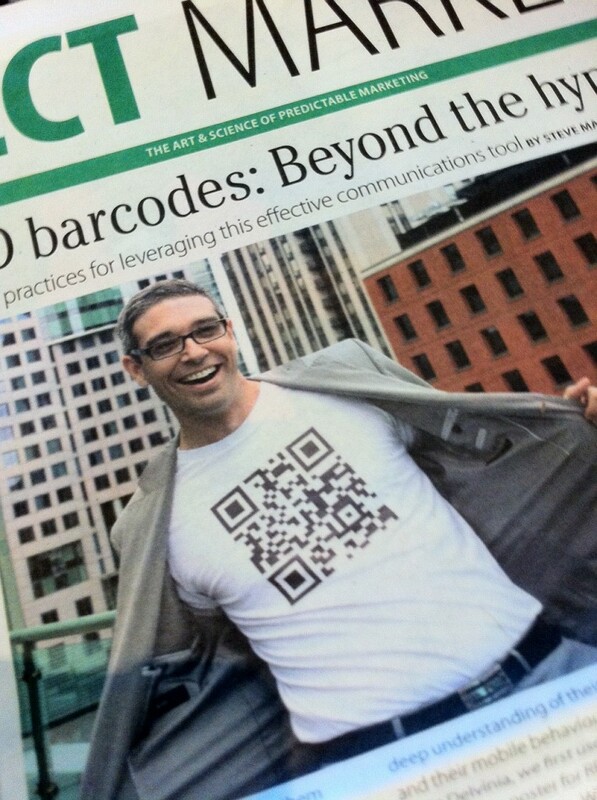 In the latest issue of Direct Marketing magazine, Delvinia President Steve Mast—pictured on the cover wearing a custom T-shirt—offers advice to marketers on how to best use 2D barcodes as an effective communications tool. The article speaks to Delvinia’s expertise in working with 2D barcodes (we’ve been using them in client campaigns since 2008) and points to the fact that consumer awareness of the technology has grown dramatically within the past year. Almost 40 per cent of smartphone owners now have a reader or scanner app installed on their phone, one in five scan something every week, and 85 per cent of those who have scanned a barcode would recommend the experience to someone, suggesting the novel way of accessing mobile content is delivering some value to users. Have an objective Ensure that your initiative matches your business objectives. Don’t use 2D codes simply because everyone else using them. Know your audience Is your audience tech savvy? Will they require additional guidance and education? How have they responded to previous campaigns using mobile or emerging technologies? Do enough of your users even have smartphones? Add value Don’t waste your users’ time. Keep the concept of mobile in mind and don’t duplicate exactly what already exists on your website. Leave a good impression with the audience in exchange for their effort. Know which 2D barcode works best for you Use the type of 2D code that will work best for your campaign. At this time QR codes are the most recognizable type of 2D barcodes. They can be scanned by almost every type of 2D barcode scanning app. Other versions of 2D barcodes such as EZ Codes (licensed by ScanLife) or Tag (from Microsoft) may better fit your needs depending on usage, size and reporting, but require specific reader apps. Size matters Once you know where your 2D barcode is being used you can begin to consider its size. If it appears on a billboard where a user may be several metres away, the 2D barcode will have to be bigger. If your 2D barcode is appearing in print obviously the user is much closer. A 10:1 ratio is the recommended standard according to ScanLife. If your user will be 10 metres away, your 2D barcode should be 1 metre in size, or if they will be 20 cm away then your 2D barcode can be 2 cm in size. Know your environment Refer back to size requirements. If outside, consider the angle and distance of the user to the signage. Is there Internet connectivity in the area? What is the lighting in the area? What is user behaviour in the area? Keep it simple Minimize the amount of information that will be embedded in the 2D barcode. If you are sending a user to a mobile web destination, use a URL shortener to simplify the link, or use a simplified 2D barcode that stores the information in a database rather than in the code itself. Set expectations Tell the user what they should expect once they scan the code. Make sure the destination is mobile-friendly. Consider the type of media. Audio or video can challenge limited bandwidth. Include instructions Tell people what the 2D barcode is and how to use it. Point users to the proper mobile barcode reader and instruct non-smartphone users on an alternative way to access content. Provide an alternative Consider users who do not have smartphones or do not have a 2D barcode scanning app. Include an alternative URL, but keep that simple. You may want to consider a SMS keyword and short code as well.